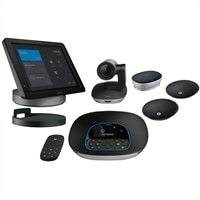 Logitech Smartdock Group Solution With Flex For Large Room Package For Skype RoomSmartDock, a purpose-built AV control console delivers convenience for meeting organizers and peace of mind for IT. SmartDock Flex simplifies cabling between the conference table and the front of the room while AV Passthrough allows for meetings outside the Microsoft ecosystem. The GROUP video conferencing system further improves the video conferencing experience with a full PTZ Camera with 90º FOV, 260º pan, 130º tilt, and 10x lossless zoom for enhanced video. Full-duplex speakerphone gives the user full control of the room. Expansion Mics (included) extend the range of the room to up to 20 people.